31 Oct With the familiar Cavendish banana in danger, can science help it survive? The banana is the world’s most popular fruit crop, with over 100 million metric tons produced annually in over 130 tropical and subtropical countries. Edible bananas are the result of a genetic accident in nature that created the seedless fruit we enjoy today. Virtually all the bananas sold across the Western world belong to the so-called Cavendish subgroup of the species and are genetically nearly identical. 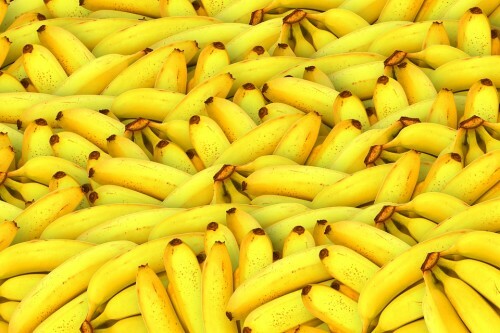 These bananas are sterile and dependent on propagation via cloning, either by using suckers and cuttings taken from the underground stem or through modern tissue culture. The familiar bright yellow Cavendish banana is ubiquitous in supermarkets and fruit bowls, but it is in imminent danger. The vast worldwide monoculture of genetically identical plants leaves the Cavendish intensely vulnerable to disease outbreaks. Fungal diseases severely devastated the banana industry once in history and it could soon happen again if we do not resolve the cause of these problems. Plant scientists, including us, are working out the genetics of wild banana varieties and banana pathogens as we try to prevent a Cavendish crash. One of the most prominent examples of genetic vulnerability comes from the banana itself. Up until the 1960s, Gros Michel, or “Big Mike,” was the prime variety grown in commercial plantations. Big Mike was so popular with consumers in the West that the banana industry established ever larger monocultures of this variety. Thousands of hectares of tropical forests in Latin America were converted into vast Gros Michel plantations. But Big Mike’s popularity led to its doom, when a pandemic whipped through these plantations during the 1950s and ‘60’s. A fungal disease called Fusarium wilt or Panama disease nearly wiped out the Gros Michel and brought the global banana export industry to the brink of collapse. A soilborne pathogen was to blame: The fungus Fusarium oxysporum f.sp. cubense (Foc) infected the plants’ root and vascular system. Unable to transport water and nutrients, the plants wilted and died. 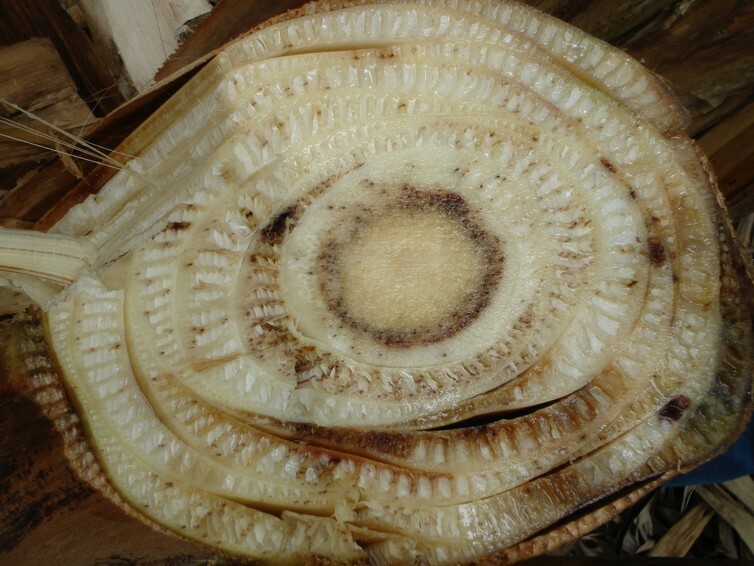 A cross-section of a banana plant, infected with the fungus that causes Fusarium wilt. Fusarium wilt is very difficult to control – it spreads easily in soil, water and infected planting material. Fungicide applications in soil or in the plant’s stem are as of yet ineffective. Moreover, the fungus can persist in the soil for several decades, thus prohibiting replanting of susceptible banana plants. Cavendish bananas are resistant to those devastating Fusarium wilt Race 1 strains, so were able to replace the Gros Michel when it fell to the disease. Despite being less rich in taste and logistical challenges involved with merchandising this fruit to international markets at an acceptable quality, Cavendish eventually replaced Gros Michel in commercial banana plantations. The entire banana industry was restructured, and to date, Cavendish accounts for 47 percent of the bananas grown worldwide and 99 percent of all bananas sold commercially for export to developed countries. Bananas in Costa Rica affected by Black Sigatoka. But the Cavendish unfortunately has its own weaknesses – most prominently susceptibility to a disease called Black Sigatoka. The fungus Pseudocercospora fijiensis attacks the plants’ leaves, causing cell death that affects photosynthesis and leads to a reduction in fruit production and quality. 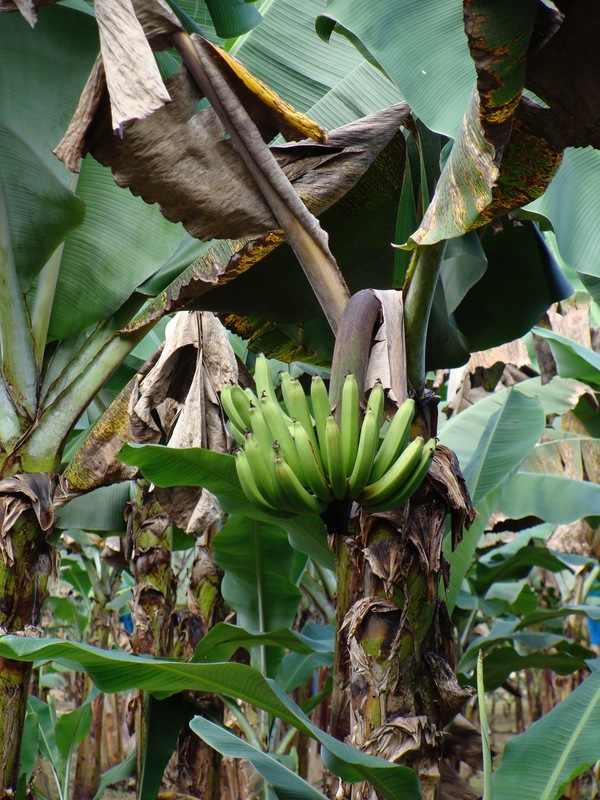 If Black Sigatoka is left uncontrolled, banana yields can decline by 35 to 50 percent. Cavendish growers currently manage Black Sigatoka through a combination of pruning infected leaves and applying fungicides. Yearly, it can take 50 or more applications of chemicals to control the disease. Such heavy use of fungicides has negative impacts on the environment and the occupational health of the banana workers, and increases the costs of production. It also helps select for survival the strains of the fungus with higher levels of resistance to these chemicals: As the resistant strains become more prevalent, the disease gets harder to control over time. Aerial spraying of fungicides on a banana plantation. To further aggravate the situation, Cavendish is also now under attack from a recently emerged strain of Fusarium oxysporum, known as Tropical Race 4 (TR4). First identified in the early 1990s in Taiwan, Malaysia and Indonesia, TR4 has since spread to many Southeast Asian countries and on into the Middle East and Africa. If TR4 makes it to Latin America and the Caribbean region, the export banana industry in that part of the world could be in big trouble. Cavendish varieties have shown little if any resistance against TR4. Growers are relying on temporary solutions – trying to prevent it from entering new regions, using clean planting materials and limiting the transfer of potentially infected soil between farms. Cavendish banana trees in China infected with new fungal disease TR4. Black Sigatoka and Panama disease both cause serious production losses and are difficult to control. With the right monitoring in place to rapidly intervene and halt their spread, the risks and damage imposed by these diseases can be considerably reduced, as has been recently shown in Australia. But current practices don’t provide the durable solution that’s urgently needed. If there’s a lesson to be learned from the sad history of Gros Michel, it’s that reliance on a large and genetically uniform monoculture is a risky strategy that is prone to failure. To reduce the vulnerability to diseases, we need more genetic diversity in our cultivated bananas. Local banana varieties in southern China. Over a thousand species of banana have been recorded in the wild. Although most do not have the desired agronomic characteristics – such as high yields of seedless, nonacidic fruits with long shelf life – that would make them a direct substitute for the Cavendish, they are an untapped genetic resource. Scientists could search within them for resistance genes and other desirable traits to use in engineering and breeding programs. 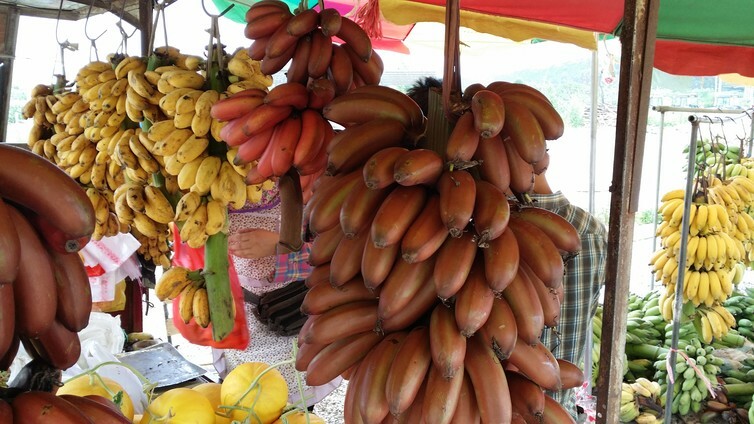 To date, though, there’s been little effort and insufficient funding for collecting, protecting, characterizing and utilizing wild banana genetic material. Consequently, while almost every other crop used for food production has been significantly improved through plant breeding over the last century, the banana industry has yet to benefit from genetics and plant breeding. But we have started taking the first steps. We now know the genome sequences of the banana and the fungi that cause Fusarium wilt and Sigatoka. These studies helped illuminate some of the molecular mechanisms by which these fungal pathogens cause disease in the banana. That knowledge provides a basis for identifying disease-resistant genes in wild and cultivated bananas. Researchers now have the tools to identify resistance genes in wild bananas or other plant species. Then they can use classical plant breeding or genetic engineering to transfer those genes into desired cultivars. 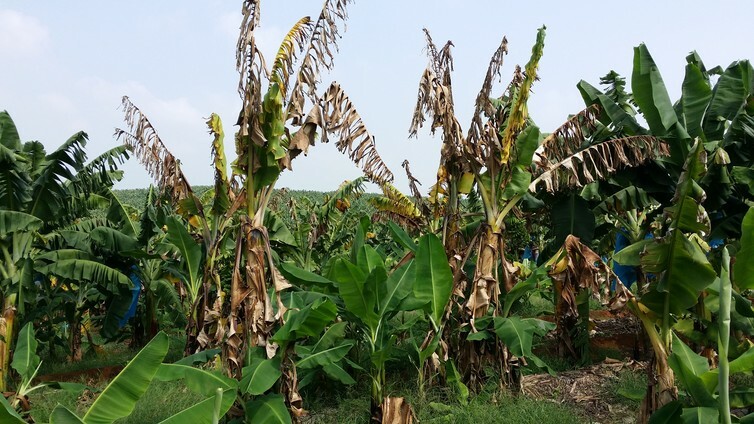 Scientists can also use these tools to further study the dynamics and evolution of banana pathogens in the field, and monitor changes in their resistance to fungicides. Availability of the latest tools and detailed genome sequences, coupled with long-term visionary research in genetics, engineering and plant breeding, can help us keep abreast of the pathogens that are currently menacing the Cavendish banana. Ultimately we need to increase the pool of genetic diversity in cultivated bananas so we’re not dependent on single clones such as the Cavendish or the Gros Michel before it. Otherwise we remain at risk of history repeating itself.